Anonymity is a very complex problem that not be solved in a single article. Before starting real action, you must double-check everything in the laboratory environment. In this manual, I will show you how hide your real IP address while scanning by Nmap, sqlmap or WPScan. We will use Tor to route Nmap, sqlmap or WPScan traffic. 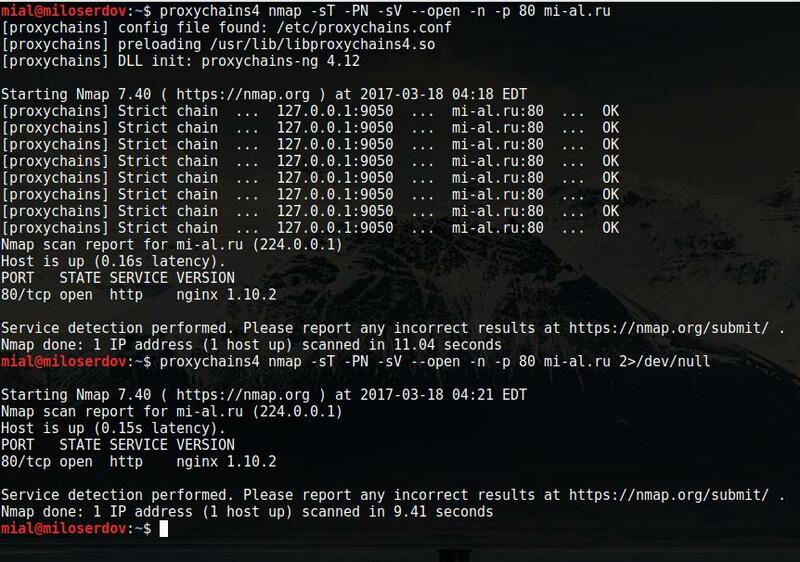 ProxyChains has a bug with nmap usage. If you try to specify a hostname as a target, it will issue the error looks like an IPv6 target specification — you have to use the -6 option. To avoid this error you should use ProxyChains-NG. ProxyChains-NG (new generation) – a preloader which hooks calls to sockets in dynamically linked programs and redirects it through one or more socks/http proxies. It is continuation of the unmaintained proxychains project. Everything is ready, but you have to know, Tor do not support Nmap traffic. You cannot just use Nmap scanning through Tor in normal manner. Nmap is one of the danger program in terms of anonymity. 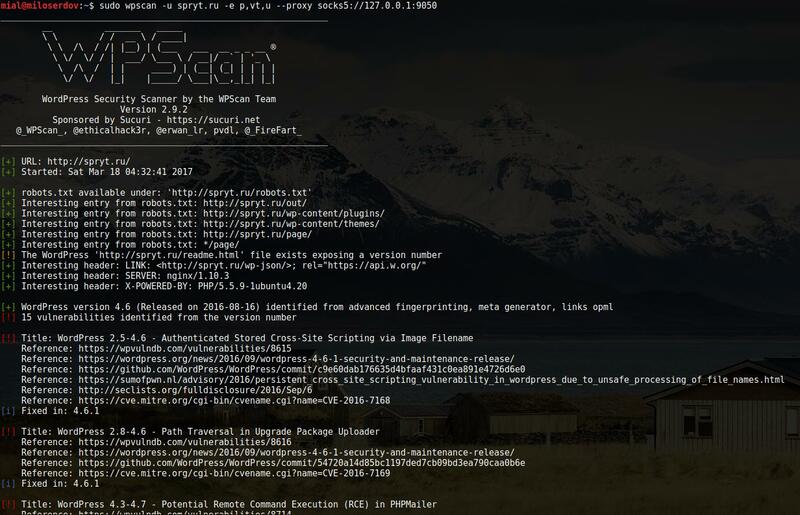 TCP connect scan is the default TCP scan type when SYN scan is not an option. This is the case when a user does not have raw packet privileges. Instead of writing raw packets as most other scan types do, Nmap asks the underlying operating system to establish a connection with the target machine and port by issuing the connect system call. This is the same high-level system call that web browsers, P2P clients, and most other network-enabled applications use to establish a connection. It is part of a programming interface known as the Berkeley Sockets API. Rather than read raw packet responses off the wire, Nmap uses this API to obtain status information on each connection attempt. When SYN scan is available, it is usually a better choice. Nmap has less control over the high level connect call than with raw packets, making it less efficient. The system call completes connections to open target ports rather than performing the half-open reset that SYN scan does. Not only does this take longer and require more packets to obtain the same information, but target machines are more likely to log the connection. A decent IDS will catch either, but most machines have no such alarm system. Many services on your average Unix system will add a note to syslog, and sometimes a cryptic error message, when Nmap connects and then closes the connection without sending data. Truly pathetic services crash when this happens, though that is uncommon. An administrator who sees a bunch of connection attempts in her logs from a single system should know that she has been connect scanned. So we will run nmap with -sT, but without sudo because the program does not require root privilege anymore. Usage of any proxy slow down the scanning, increases delay of response, therefore you may be interested in -p option (to determine ports for scanning) or -F: Fast mode - Scan fewer ports than the default scan. Tells Nmap to never do reverse DNS resolution on the active IP addresses it finds. Since DNS can be slow even with Nmap's built-in parallel stub resolver, this option can slash scanning times. At last the option --proxies, you should avoid usage of the option if you are not absolutely sure what it does. Asks Nmap to establish TCP connections with a final target through supplied chain of one or more HTTP or SOCKS4 proxies. Proxies can help hide the true source of a scan or evade certain firewall restrictions, but they can hamper scan performance by increasing latency. Users may need to adjust Nmap timeouts and other scan parameters accordingly. In particular, a lower --max-parallelism may help because some proxies refuse to handle as many concurrent connections as Nmap opens by default. This option takes a list of proxies as argument, expressed as URLs in the format proto://host:port. Use commas to separate node URLs in a chain. No authentication is supported yet. Valid protocols are HTTP and SOCKS4. Warning: this feature is still under development and has limitations. It is implemented within the nsock library and thus has no effect on the ping, port scanning and OS discovery phases of a scan. Only NSE and version scan benefit from this option so far—other features may disclose your true address. SSL connections are not yet supported, nor is proxy-side DNS resolution (hostnames are always resolved by Nmap). As you can see, indeed the --proxies flag does not increase anonymity. It can confuse you. I recommend you consider usage of --request-timeout 500 --connect-timeout 120 options, because scanning through Tor leads to significant delays.